ADA Cosmetics International GmbH, based in Kehl, is well-known as a German pioneer of the hotel cosmetics industry and today is a leading manufacturer of hotel cosmetics. The company offers innovative and effective solutions from a single source. Correctly monitored manufacturing processes in bottles, jars and tubes, produced in millions every year, ensure the premium quality of the products made in Kehl. HC-A checkweighers from WIPOTEC-OCS play an important role here, due to their 100% product control. Every single article is subject to a precise weight check before delivery. 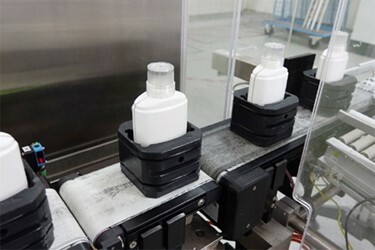 This ensure that cosmetic products are filled up correctly and the manufacturing process for each individual product has been completed without errors. All the checkweighers are interconnected together using Comscale - a central data management solution from WIPOTEC-OCS for inspection systems.